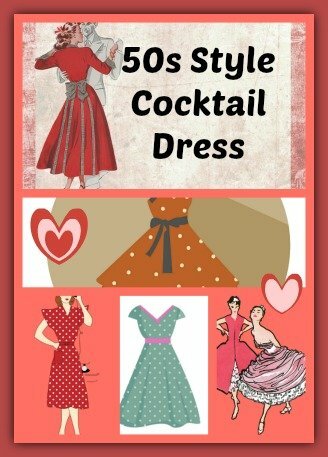 Look smart and feminine retro style in the 50s style cocktail dress – vintage tea dress – vintage prom dress. The vintage style tea length dress can be worn as a casual, cocktail, business or office wear and for more formal occasions too. Wearing a tutu petticoat underneath would help get the full silhouette flare skirt design, so popular during the 1950s. The 50s style swing dress has such an elegant, gorgeous and feminine look. The tea dress vintage 50’s inspired wedding dress truly looks sweet, stunning and glamorous. The 1950’s style tea length wedding dress like this dreamy white vintage dress would turn you into a glamorous bride just like in your grandma’s time. The retro tea dress bridesmaid fashion will always have a fan base – glamorous and charming. Tea length cocktail swing dresses with or without sleeves give you a flattering form fitting classy look such as this sleeveless vintage tea dress with belt worn with a petticoat to give it a classy fit and flare look. They double up as beautiful vintage prom dresses too. These vintage cocktail dresses are mostly made of at least 90% cotton/nylon and balance with spandex making them comfortable with a bit of stretch. This beautiful floral cocktail dress is made of cotton blend and has a zipper at the back. You’ll look wonderfully feminine wearing this with a black petticoat underneath for that flared skirt effect. You’ll look lovely wearing this 50s floral cocktail dress whether to the office party or just looking your best going to Church. My cousin wore this to my aunt’s birthday dinner and she ended up being the ‘star’ at the dinner. An elegant sleeveless knee length square neck swing dress, it comes with a center back zipper. It is made of 95% cotton and 5% spandex. The gorgeous swing dress with the beautiful black and red flowers is slightly stretchable. Form fitting and comfortable, this 50s style cocktail dress can be worn as casual wear or to a party or wedding. Made of 90% nylon and 10% spandex, it comes with an adjustable belt for a better fit. The satin belt is sewn into the dress and can’t be removed. This elegant retro cocktail dress with cap sleeves has 2 kinds of contrasting lace pattern. You can choose between dark red and purple, navy blue and black as well as navy blue and green. It comes with a darker layer lining underneath the lace pattern top layer. It is recommended for hand wash only. Ironing is not recommended. This beautiful dress can be worn to work or to a party. This elegant vintage A-line knee length cocktail dress is made of polyester and spandex. Wouldn’t you love to have this sweet black lace panel cocktail dress hanging in your wardrobe? This halter neck knee length polka dot 50s inspired cocktail dress is made of polyester. The adjustable halter straps tie with a bow at the back of the neck. You can get it in black or white polka dots. The dress comes with a waist band that is form fitting and flattering, giving the impression of a slimmer waist. This elegant and feminine retro style cocktail dress in royal blue comes with a back lace-up closure. This A-line silhouette party dress comes with ruffles, tulle overlay as well as a built-in bra. This glamorous 50s style tea length cocktail dress lends an air of grace and elegance to the wearer. This is a made-to-order dress. 50s style cocktail dresses can be worn on most occasions and events, whether casual or formal. They never seem to ‘go out of style’ or popularity. As for me, I would certainly love to have more than one of these beautiful vintage 50s style cocktail dresses in my wardrobe.